john4jack (Corvallis, Oregon, United States) on 1 January 2010 in Cityscape & Urban and Portfolio. Time moves faster than I can handle. It seems to accelerate as the years go by. Happy New Year everyone. Continue to pray for peace for our fragile world. Love this, Jack! The colors and the motion are wonderful. Happy New Year to you, too. Thanks for stopping by and offering kind words and encouragement to me here on Am3 (except when you called me sexist. ;) Keep clicking! Your image says it all, things are moving so fast one can hardly keep up. Those with a creative passion such as photography usually are already a kind person. Enjoy this new year and continue to capture your beautiful images. love the movement, if frozen for just a moment.. the slash of color really brings some contrast! Very cool motion shot. This is how fast the past year seemed to go by. Happy 2010.
le passage rapide de 2009 à 2010 sans doute ? Bonne et belle année à toi Jack et à toute ta famille. ~` great picture~` swish ~` happy new year and a great 2010.. Fly! A great way to take off! I've always said you were a master of the noble art of photography and I confirm it today! We are 365 pictures to enjoy from the present day! Besos teacher! Superbe photo. L'année commence sur les chapeaux de roues !!!! Bonne année 2010. Best wishes and Happy New Year to you and all yours, that the year is bright and full of happiness. That the world gets better! The peace moves in the hearts and runs the world. Time flies and leaves us to face ourselves and sometimes we want to make a U-turn. Have no fear, Jack, you are a very good photographer !. Friendly thoughts for you. Nice thoughts for a new decade, Happy New Year. I love the blur and the colours in this shot Jack...superb! I wish you and your family a beautiful and peaceful new year...amazing, it's 2010! Rushing right on into the new year, ey???? Cool shot !!! And I'm sure that along with becoming a better person, you're bound to become a better photographer too!! I'm learning, that practice may not make perfect, but it sure does make improvements!! Happy 2010 !!! This speeding car is even better than the last one! I'm truly amazed at how quickly I've turned into the oldest member of our morning coffee group! How did that happen! :-) I wish you success in your quest for personal improvement and I'm confident your success as a photographer will accompany that effort. May 2010 be your best year yet! zO-O-Om!! zO-O-Om!! zO-O-Om!! zO-O-Om!! zO-O-Om!! zO-O-Om!! zO-O-Om!!zO-O-Om!! where we are ? in 2010 :))) zO-O-Om!!zO-O-Om!!zO-O-Om!! A wonderful documentation for the speed in our lives ... is (or was) this a rescue truck? @Judy: One of the great things about moving a year ago was getting rid of an unbelievable amount of stuff. I find that as I clear out and simplify the external trappings of my life, there seems to be much more interior space. Japanese homes and Japanese gardens have long been a primary metaphor for me. And when it comes to clearing out space, I purposely leave significant blank spaces on my calendar. Too much agenda is as demonic as too much stuff. Part of the appeal of the desert Southwest is its simplicity. Simplicity - such a worthy goal for our photography as well as our lives. Wish you the best for 2010 and see you with pleasure all along this new year to share our passion for photography with the great A3 communauty... :-) Thanks for your faithfulness since 2 years and your kind words. Have a nice day Jack. @Evelyne Dubos: Jay Maisel, the great photographer and teacher, said, "If you want to become a better photographer, become a better person." No-one embodies that more than you do! Happy New Year, John... and kisses for Beau. I like your Zooom pic... As our life which runs too fast, indeed. Very cool shot to symbolize time. My theory about time is one of relativity. We look at a year in relation to how long we have been alive. If you are one year old, one year is a life time. If you are 50, one year is 2% of a life time. A terrific image, Jack. I never worry about how fast the years go by, I just try to enjoy every moment on this beautiful planet and hope that I treat people as I would like to be treated myself. Age is just a number and my wife seems to grow more beautiful with every year that we spend together. Have a great New year and thanks for your amazing photographs and wonderful words. @SOUL AFLAME: Love does indeed increase beauty!! You had found a great spot for photography and kept shooting amazing photos! Loved this one and the one before! Happy new year Jack. Your pictures remember me of the times I stayed in Portland and Beaverton. Happy New Year Jack! Thanks for sharing such inspiring photos. This one captures exactly how I feel! Happy new year for your and your family. A great colorful and lively shot. Have a wonderful 2010! Beautiful colors and speed for this first photo 2010 ! I wish you a Happy New year ! Your 'signature image' huh? 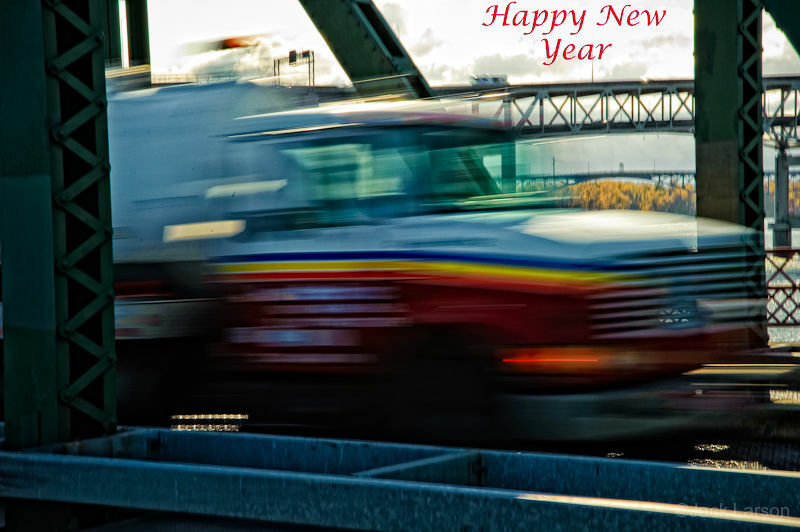 Ok, slow down - and have a great 2010! Love the colors! Great start to the new year....best wishes. And I already feel the year speeding up...cheers! A perfect capture to describe your observation of time. Have a Happy New Year! the time running, good pic for the new year !! @Dulcie: That speed lies behind my top three resolutions for 2010. Resolution No. 1 - simplify. Resolution No. 2 - simplify. Resolution No. 3 - simplify. Happy New Year to you, Jack. A lovely colourful start to the year! ecxellent and very fresh. Happy new year, all the best from Athens Greece, Dimitrios. Beautiful colours and movement ! Wish you the best for 2010 ! I share your wishes for peace and your new year's resolution!! I also like the image.